Explanation: An astronomical trip from the California Nebula to the Pleiades star cluster would cover just 12 degrees across planet Earth's night sky. That's equivalent to the angular extent of 25 Full Moons, as your telescope sweeps over the borders of the constellations Perseus and Taurus. This wide and deep mosaic image of the region explores the cosmic landscape's dusty nebulae and colors otherwise too faint for your eye to see. On the left, cataloged as NGC 1499, the California Nebula does have a familiar shape, though its coastline is actually over 60 light-years long and lies about 1,500 light-years away. The nebula's pronounced reddish glow is from hydrogen atoms ionized by luminous blue star Xi Persei seen just to its right. At the far right, the famous Pleiades star cluster is some 400 light-years distant and around 15 light-years across. Its spectacular blue color is due to the reflection of starlight by interstellar dust. 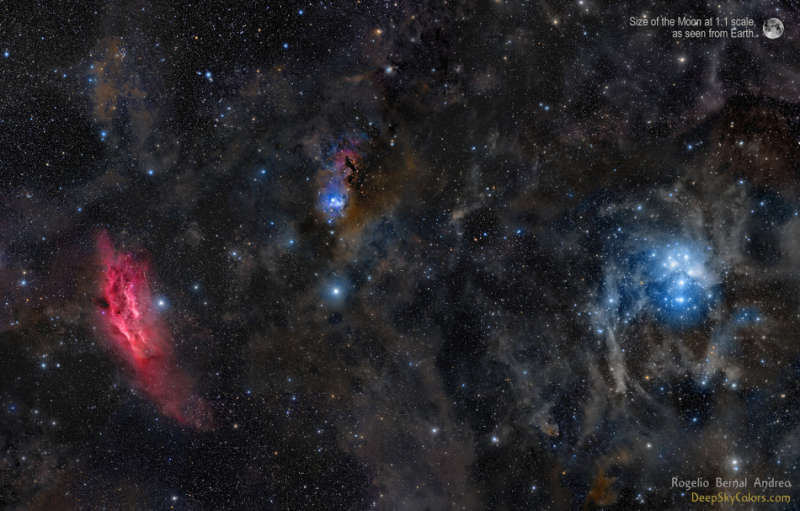 In between are hot stars of the Perseus OB2 association and dusty, dark nebulae along the edge of the nearby, massive Perseus molecular cloud.